This DJI Osmo Pocket Gimbal Kit with HPRC1400 Hard Case put together by B&H includes an Osmo Pocket gimbal and hard case. 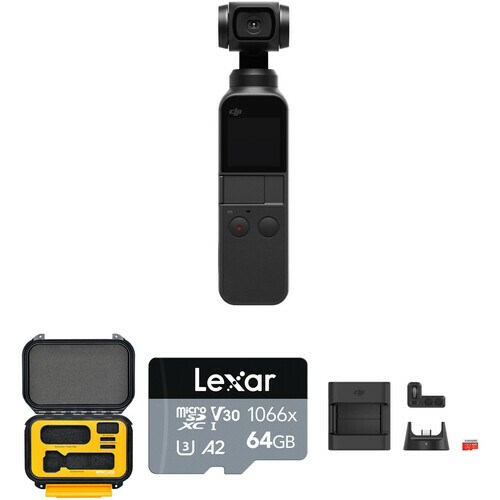 The Osmo Pocket is a compact, handheld 3-axis gimbal stabilizer with a 1/2.3" sensor camera that records up to 4K60 video and takes 12MP stills. An optional Wireless Module is required for Bluetooth and Wi-Fi connectivity. The waterproof, impact-resistant HPRC1400 hard case is designed with a custom foam interior to secure your Osmo Pocket, smartphone adapter, and power cable. Use DJI's Mimo app and your iOS or Android smartphone to polish your footage with preset shooting patterns, camera motions, filters, and soundtracks. Connect the Osmo Pocket via the included USB Type-C or Lightning adapters to use your smartphone as a larger viewfinder with the Mimo app. Add the separately available Wireless Module for remote control and transmission. A Pro mode enables you to adjust the camera's ISO and exposure settings for maximum creativity. In Pro mode using the Mimo app. Via included USB Type-C or Lightning (iOS) adapter. Box Dimensions (LxWxH) 9.5 x 5.85 x 2.15"